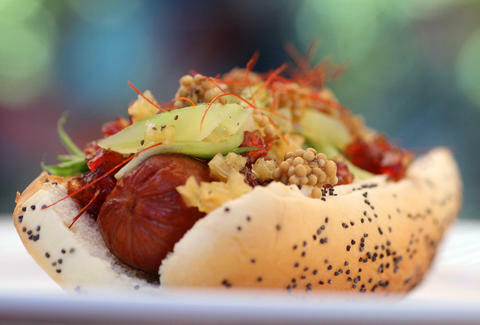 Graham Elliot's entry in the Search for the Most America-est Hot Dog needs your vote! The hot dog is as American as Gladiators (the spandex kind) and apple pie, and since Chicago is clearly the apex when it comes to hot doggery, the Chicago-style hot dog is therefore the most American style of hot dog out there. So when we tapped masterchef Graham Elliot to make the most jingoistic tube steak of all time this Independence Day, there was only one choice: The Chicago Dog 2.0. Get ready to update your tastebuds with lavish trappings like a filet mignon hot dog and mustard caviar as you prepare to vote for it in the Search for the Most America-est Hot Dog, but only after you scroll down to see exactly what he put together. The 2.0 dog is a re-imagining of the traditional Chicago-style ingredients on the veggie-laden wiener that’s stained many a shirt over the years, taken to previously unseen levels of innovation that make it the perfect symbol of the country that figured out how to land on the friggin' moon. This is the filet mignon of hot dogs. 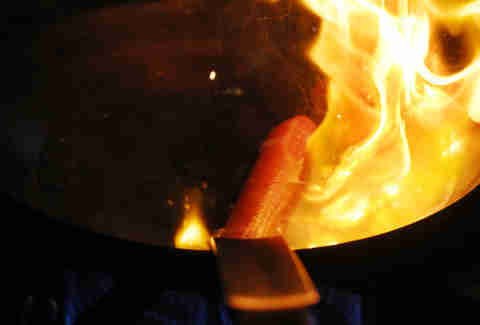 Literally -- they start off by cooking up a filet mignon frankfurter that’s been lightly smoked and cured. The frank makes its way to a poppy seed bun (the only holdover from the traditional recipe) where it’s topped with red onions seasoned with brown sugar & red wine vinegar, which beats that sketchy dicey hand-crank machine at the ballpark. And most other onions as well. 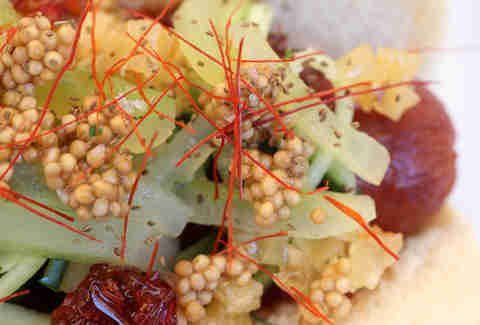 Add in some green tomato confit (Mary Louise Parker would be proud), as well as some pickled celery root relish, a nod to two classic Chi dog ingredients: celery salt and neon green relish. 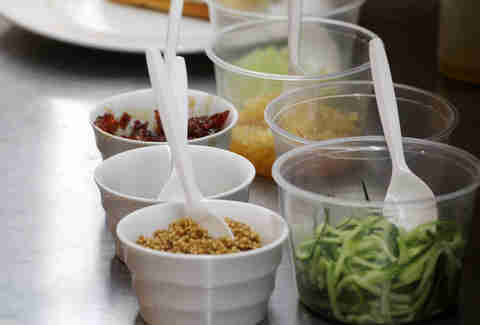 Things get finished off with some cucumber "noodles" and dehydrated chili threads to replace the spice of the sport peppers, and a little mustard seed caviar that would totally make the Grey Poupon dude lose his mind if he saw it. And there it is: the magnificent Chicago Dog 2.0. If you have so much as an ounce of civic pride, you’ll vote Graham’s master dog as the best in our Thrillist hot dog challenge here. If not, may the workers at Wiener Circle make you leave in tears.